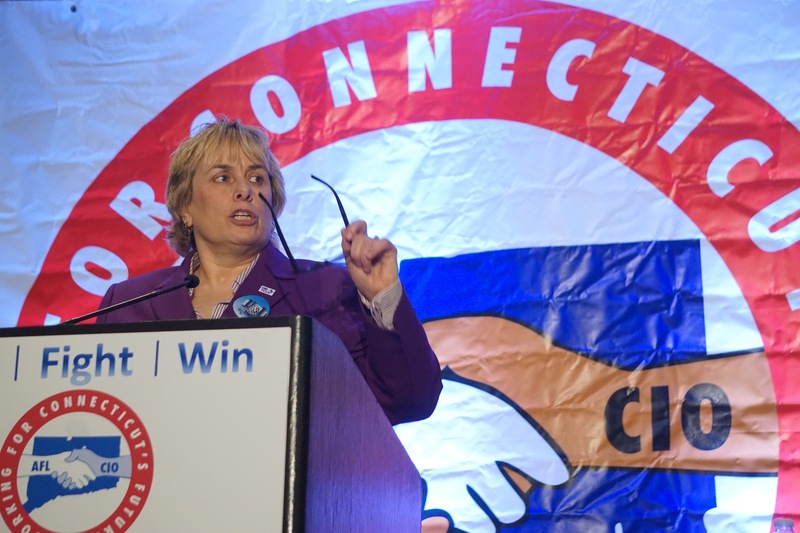 Lori Pelletier, president of the Connecticut AFL-CIO. Tom Foley, the GOP gubernatorial nominee in 2010 and 2014, addressed the AFL-CIO in each of his campaigns, knowing he could not win its endorsement. But he shied away from the frontal assaults on collective bargaining that are applause lines for most of the GOP candidates this year. Ned Lamont addressing the labor convention. 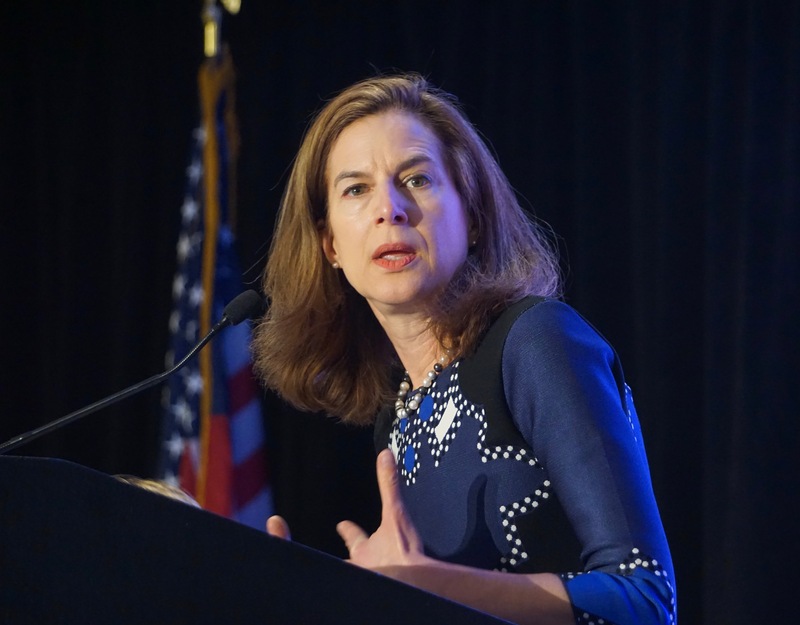 The straw vote, a first for the AFL-CIO, was a blow to Susan Bysiewicz, the former secretary of the state. She finished fourth with 10.9 percent, just ahead of the 9.5 percent who chose, “No one at this time.” Bridgeport Mayor Joseph P. Ganim was last. Jonathan Harris, the former state senator and consumer protection commissioner, was second with 14.7 percent, followed by the former veterans affairs commissioner, Sean Connolly, with 11.4 percent. Ganim had 6.6 percent. The vote was conducted online after all five candidates spoke. 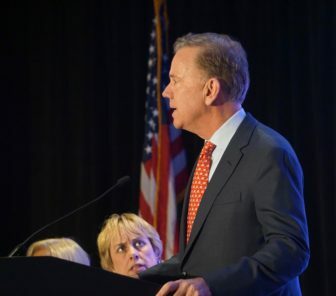 Pelletier said the convention Friday was the earliest effort by labor to engage its members in a race for governor and marked the first time labor tried to express a preference for candidates before the parties’ nominating conventions in May. Bronin said he found the format too confining. Instead, he answered the questions in writing. 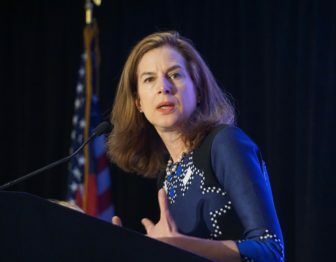 “I strongly support the right to organize and the right to collectively bargain, and I have tremendous respect for what the AFL-CIO does and fights and advocates for, working families here and in the state of Connecticut,” Bronin said. 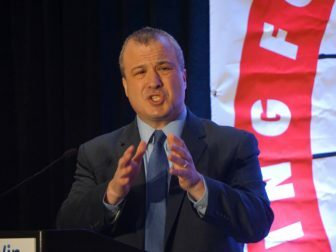 Pelletier told the delegates Bronin was the only Democrat who objected to the format. In the AFL-CIO’s view, Bysiewicz and Harris answered 100 percent of the questions correctly, while Lamont was at 97 percent, Ganim at 95 percent and Connolly at 82 percent. Lamont checked “oppose” on supporting the fee on employers with low-wage workers and yes on everything else. All five candidates in the straw poll addressed the delegates. None were present when the poll results were announced. He paused. His audience laughed. The delegates screamed and applauded. By voice votes, the delegates formally endorsed the five Democrats seeking re-election to Congress: John B. Larson of the 1st District, Joe Courtney of the 2nd District, Rosa L. DeLauro of the 3rd District and Jim Himes of the 4th District. Two years ago, Himes was the only Democrat who did not seek labor’s endorsement. Comptroller Kevin Lembo and Secretary of the State Denise Merrill also were endorsed. The delegates will meet again on June 22 to consider endorsements for governor and other races. If necessary, they will meet again after the primary in August.